It's been too long since I've done a cookie pop, but when this idea popped (pun intended) into my head, I knew I had a winner! It's cute, it's easy, it's fun! 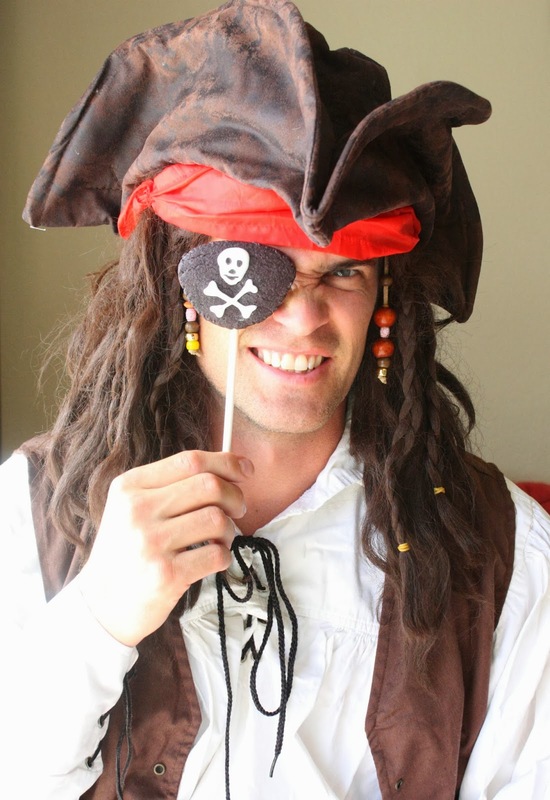 I was thinking about pirates because Sept. 19 was "Talk like a pirate day." Who knew? I didn't find out until that very day (Aaarrrrggghhh! ), and wanted to join in even though I was short on time. Well, I didn't get to them until the next day, but that's okay...it is the season for costumes, pretending, and dress up fun. Wouldn't these pirate patch pops be perfect for a pirate party favor? Say that five times, fast! How about a Halloween/costume party? Make cookie dough, and add black food coloring, mixing well. Roll the cookie dough out, thick enough to insert a stick into. Place template onto the dough and cut around it with a sharp knife. Transfer to a baking sheet, lined with parchment paper. Place the baking sheet in the freezer for 5-10 minutes before baking. After taking from freezer make a small slit in the bottom of dough patch. Insert the lollipop sticks into each one. While they cool, make the royal icing. Using the royal icing, pastry bag and #2 tip decorate the patch with a skull and cross bones. Arrgh! Such a fun idea! So super adorable Sue. You know I love all your ideas! You make me laugh, Lisa! Aaarrrrrr, how fun would these be! =o) Totally fun! Haha, thanks for your comment, Erin! Sue, you are so so talented! Those pirate eye patch cookie pops are so adorable. Ah ah ah Sue, I love it! 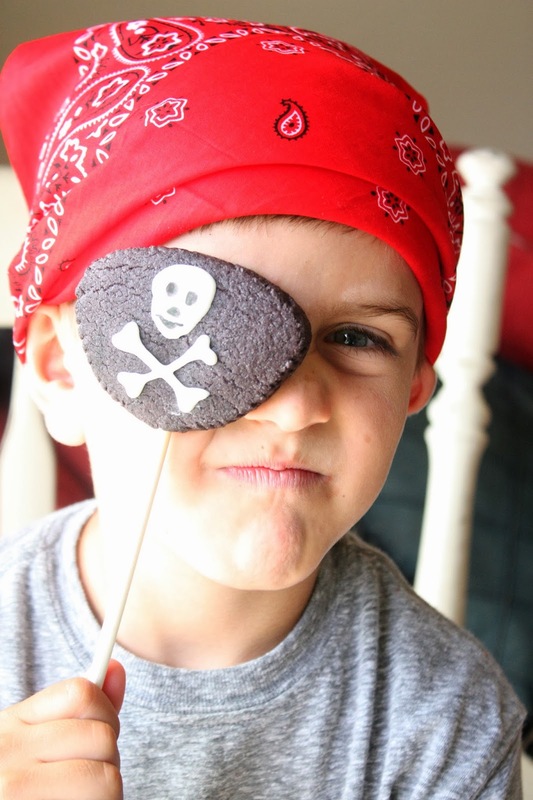 I love this idea and whenever I have a pirate party - I'm for sure going to make them!! So clever matey! Well I know what I'm making next time we have a pirate party! These are amazing and so fun. I am just tickled with these cookies. You have the most adorable ideas! Cute cookies, and cute pirates, too! Super cute! My Son In Law is planning on being a pirate this year and wants to follow in our over the top Halloween night tradition - but take it tons farther than we ever did - and build a pirate ship for his front porch. I should make him these to encourage him! Wow, wish I could be there:) Thanks for your comment, Jacqueline! What a cute idea! These might not make it to the eye in my house. Ay, Matey! This is too cute. Such a clever idea! I love how you included your pirates in the post. Aaargh! Oh, Sue! They are so adorable!I love them! Such a fun idea Sue! I was amazed at how you were able to draw the pirate skull on the cookie like that-wow! Thanks, Jenni! At work today, I shared your blog with my co-workers and everyone was amazed!